The real-life journey of steelhead trout — fighting their way upstream from salt water to fresh to spawn each year — is nothing compared with the 30-year odyssey of Kate Pond’s “Steelhead” sculptures. After nearly a decade in limbo, her fish recently returned to their original “hatching ground,” the Winooski Falls park. “These fish have had quite a life,” says Pond. 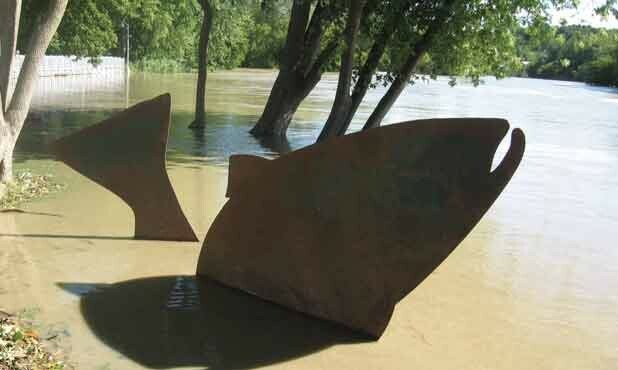 The Burlington sculptor, who is well known for her steel works — including “Kiss II,” which looks like an amorous pair of letter Fs, outside Fletcher Free Library — crafted the five fish from Cor-Ten steel in 1981. Ray Pecor, who owned the Champlain Mill at the time, had commissioned her to make something for the adjacent park along the Winooski River. “I knew that he liked to fish,” says Pond, and so did she. So Pond suggested a series of sculptures that replicated the steelhead’s annual spring run. It was her first public piece. Pond had worked with steel before, but never on pieces so large. She built a gantry to hoist each fish, the biggest of which is 12 feet long and about 800 pounds. It’s the same gantry she uses now in the South Burlington workshop she shares with sculptor Kat Clear. Pond left the surfaces of the fish unfinished because she wanted them to accumulate rich layers of rust. These days, they are bright orange in some places, dark brown in others and slightly green where they’ve been tagged in the past. Intricate textures have cropped up where the steel has been sandblasted and begun to rust over again. The medium hasn’t always been an easy sell. When Pond installed her library sculpture, many viewers recoiled. “They didn’t understand the rust,” surmises Pond. Pond recalls her shock in 1991 when Winooski city workers decided to paint her fish green. Back then, she says, she didn’t have experience with contracts and copyright. When she sold her sculptures to the city, “We just shook on it,” she says. As a result, the artist had no say in the fish’s fate. Luckily, the city understood her concern and let her sandblast the paint off the following day. In 2002, when construction began on the park, the fish were carted away to a Winooski garage. And there they sat, wedged between a chain-link fence and out-of-service machinery, for the next nine years. Pond says she visited them there occasionally. This past spring, Winooski photographer Dan Higgins, who has documented the Onion City for decades, suggested the city reinstall the fish. With the help of Winooski city manager Katherine Decarreau, engineer Steve Palmer and downtown superintendent Rick Gaulin, the fish made their triumphant return to the riverfront this fall. With any luck, it’s their final migration.